Back in February 2015, we crashed the van. We got caught out with the weather. Not something I want to go through again. I was left without a van or mode of transport for sometime taking to alternating between running, cycling or getting the train to work. Most of my rides start from my place of work and I used to drive the 15minutes before riding. Without the car it forced me to rethink where I rode. After exercising most of what ever singletrack Kendal had to offer, I did a 60km spin over Gatesgarth and Nan Bield. A good test for the new Gryphon. As much as I was enjoying not having a van, I started to feel like I didn’t have the freedom I wanted. So after a month, the search for a new mode of transport began. Defenders, hilux pickup, forester and t4/t5 campers were all on my ‘watch’ list. After some thinking, I decided on a camper. As far as my budget went, I was looking at t4’s mainly. I was finding it pretty hard to find something that kept bikes inside, and had room for cooking and sleeping. I ended up finding a vito with something similar to what I wanted. Still not ideal but close. However, it was taken offline and when asking if it was still available, the price almost doubled and went out of my price range. It then led me to making a camper conversion from a standard van. I could get a van that was in better condition, and get what ever I wanted inside. I set myself a budget and planned it all out. I originally planned on using a company that specialises in conversion to do part of the work, but as it went on, I decided against this and ended up doing all of it myself with a bit of help from some friend & family. I ended up going for a Vauxhall Vivaro. It had been owned by a string of motorcross riders and had generally been looked after with little body work damage – especially when compared to a typical builders van. However, it hadn’t been well cleaned and we first worked on stripping it all back and getting out the mud for the back. Next was to have a window fitted and to remove the bulk head, which had actually been riveted in and then coated with some sort of plastic which made it VERY difficult to remove. I also lowered it 35mm on some new banded steel wheels (8.5″ wide) and changed the lights to HID. From the outside, it was there! After tidying the inside and removing any rust from the mud/water, we started to insulate and line the van out with new ply. Then the fun started. I had a local joiner come and help build the bed and partition in the back. I had plans with dimensions so we started by trying to stick to those as close as possible. It changed quite a bit while we were going but I ended up happy. We build a separate section for bikes in the back and some storage underneath for kit and clothing. It also ended up being the space for the electrics. In the front there was a bench that could seat three that pulled out into a double, storage underneath and then a spare seat, a little taller, specifically so the cool box could fit underneath. With the addition of a double swivel seat in the front, it made the rear space more than enough and in essence, we could have six drinking beer in the back after a ride if it was cold and raining outside. I added a 110amp leisure battery with 5 LED lights (4 to the front, 1 to the rear), a 12v socket routed for the cool box, a switch panel with an extra 12v socket and two sub ports, a 300w inverter (more than enough for my camera charger), a split charge relay, and a cable to power a sub-woofer and the stereo system when the engine was not running. We also add hookup with three UK sockets and a battery charger. It all worked out nicely and all that was left was to carpet the bare wood and get some foam for the bed. 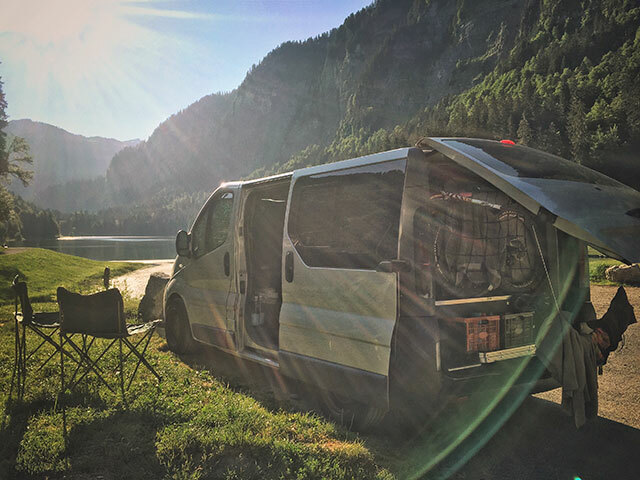 We only had a few weeks left before we had planned to leave for a eurotrip – a real test of the new van! I did a quick test stop over at Mardale head just to make sure everything was ok. I slept one thin bit of memory foam which wasn’t great so was looking forward to getting some proper stuff made up. However, the foam ended up being a problem. I had ordered online from ‘ACE FOAM’ with, what I thought, plenty of time before we left for France. I was having it sent to my Nanas house who was making cushion covers with some fabric she had spare. I was told when I ordered on the Monday that it would be there Wednesday, Thursday latest. Friday came around and there was no sign. I was supposed to be collecting them the following Tuesday and there was now hardly any time to get the covers made. After calling ACE, the tracking number said that it had been delivered and left in a porch. It hadn’t. The delivery company said they’d be able to send a driver round to locate the parcel. Monday came and there was no sign of either a driver or the foam. ACE were kind enough to resend the foam I’d ordered FOC on a next day service. There was no chance for covers now but at least we’d have something to sleep on. I turned up on Tuesday expected to collect the foam and be away. There was still no foam. I called ACE again multiple times that afternoon and after being told the driver was in the area ready to deliver any moment, I waited. And waited. And waited. Until it was 17:30 and there was still nothing. The following morning at 8am I called ACE to cancel my order and request a refund. No foam and I had two days to go till we left. Luckily I had the morning off work so drove around a few places local to get some foam cut. We ended up finding what we needed, be it a little more expensive and not quite the same as what we’d ordered, and used a throw to cover up the foam when sitting/sleeping. So that was it. We were ready to go.